How far away can this antenna be from the broadcast towers? Will this antenna work with my HOA? Can I install this antenna myself? Do I need an antenna that will stand up to the elements? 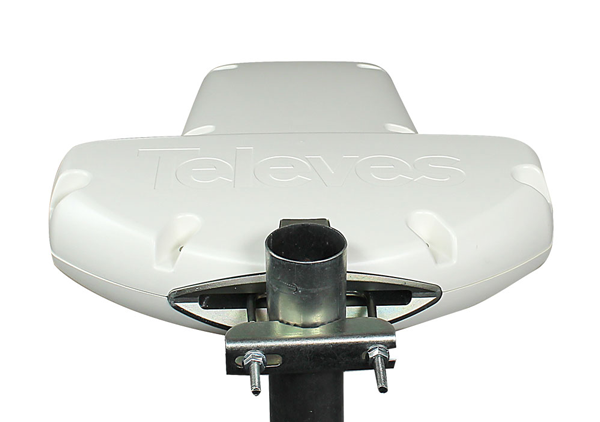 Televes has proven itself in the US with its line of outdoor antennas. While the larger antennas got a refresh a few years ago, the smaller DigiNova has soldiered on for several years without an upgrade. It’s a good design and didn’t need a lot of change, but it’s now available with a long-promised upgrade and vastly improved performance. Introducing the new Televes DiNova Boss Mix antenna. Starting with all that was good with the DigiNova, the DiNova adds improved performance in VHF, which is extremely important for the US as most channels will be moving to lower frequencies in the next few years. This review is available in PDF format! View it now! Let’s start with the retail packaging. This year’s packaging is smaller than the DigiNova, which means that more antennas can fit in a shipping container, saving money. Because this antenna is made in Europe, it’s not subject to excessive tariffs and shipping is the only real cost to worry about besides manufacturing. The big addition this year is a set of extendable VHF dipoles which come from the side. Otherwise the antenna looks almost identical to the DigiNova. The DiNova retains its heavy metal mounting bracket built into the back. This picture is of the old DigiNova but it looks identical from this angle. The top antenna is the DigiNova. The bottom one is the DiNova with the VHF dipole extended. What’s interesting here: The DigiNova always had notches on the side, as you can see. We never knew why, and it’s obvious that the VHF dipoles were always part of the plan. As with the DigiNova, there are stickers on the bottom of the antenna along with the connection for RG6 cable. This makes the antenna more recognizable from the bottom. That makes sense since you’d never really see the antenna from the top once it’s mounted. When mounted on a mast, the DiNova’s extended dipoles look completely appropriate. They provide better performance in the VHF range and by making them fold into the antenna, it ships more easily. There isn’t really a case where you’d ever fold the dipole back in once it’s installed, although you could if you wanted to. If you plan on moving the antenna from place to place, it’s nice to know it will fit back in its box if you want. Amplified antennas are all the rage, because they let you drive multiple TVs and help you with fringe reception issues. This antenna comes with an innovative amplification system that is much better than others on the market for several reasons. Most mast-mounted amplifiers and amplified antennas put the amplifier outside near the antenna. This is done so that amplification takes place before any losses due to the cable between the antenna and the home. When you use an amplifier like that, you need to use RG6 cable with a solid copper core. This is the only cable that will actually carry power up the line so the amplifier can actually work. However, you can’t get that kind of cable at your local home store and you may not want to climb all around to install new cable. That’s why the DiNova Boss is passively amplified, and it’s one of the few antennas on the market that is. Most amplified antennas won’t work at all if they’re not powered, but the DiNova Boss will. If you don’t need an amplifier, don’t use it. The DiNova Boss includes this power injector that sends power up to the amplifier and also lets you run up to 2 TVs without adding an additional signal. It plugs into the wall inside and safely does its job. The DiNova Boss, just like the old DigiNova, includes a U-shaped bolt and a clamp, plus two nuts to connect to a mast. Almost any mast should work. The u-bolt threads through the slots on the back of the antenna and the notch on the antenna nicely accommodates the mast for a snug fit. Because the bolts are metric and not everyone has metric wrenches, a simple wrench is included as well, which is a nice touch. There are actually two sets of slots so that the antenna can be mounted vertically instead of horizontally. This is done so that it can be used with broadcasts using vertical polarization. In the US all TV broadcasts use horizontal polarization so the antenna should be mounted as shown. 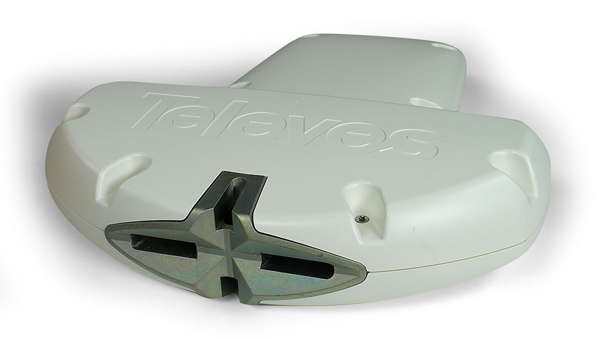 Solid Signal chose to partner with Televes after an extensive worldwide search because Televes stands for the same things we stand for: quality, performance, and customer satisfaction. 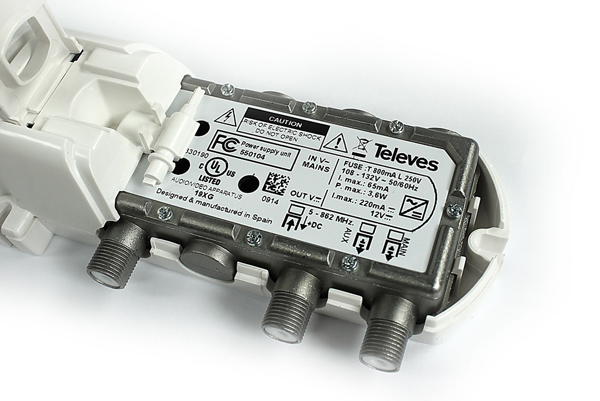 Televes is based in Spain and designs and manufacturers all their products in Europe. The manufacturing quality is far above other similar products. The company has been around since 1958 and is a worldwide leader in antennas, satellite products and test equipment. They’re used by all the major satellite companies for their own test and measurement systems. 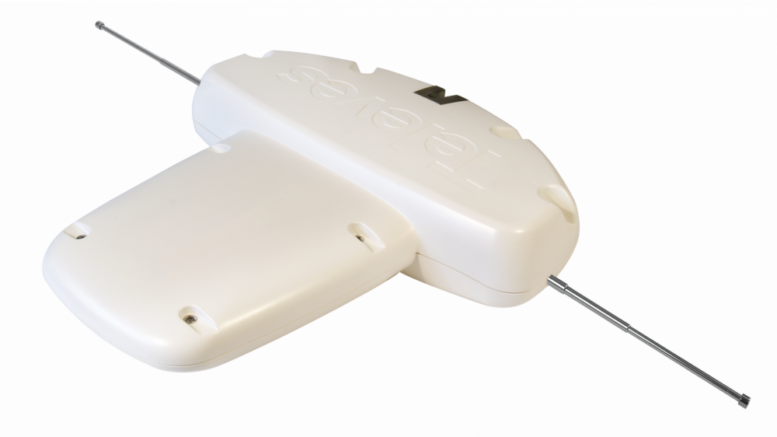 If you think Televes products look similar to Chinese-made products, there’s a reason for that; they’re the most popular antenna brand in Europe and therefore an easy target for reverse-engineering. The difference is obvious when you actually get your hands on an antenna, though. This is a solidly-built product designed to last for years. Solid Signal is the exclusive direct retailer and distributor of Televes products in the US and we’ve worked hard to bring Televes antennas to our customers at a price that compares to much lower-quality antennas. Why is LTE filtering important? 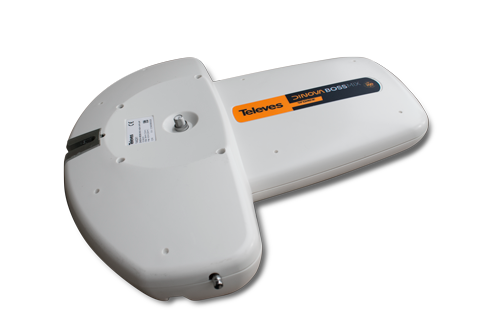 Televes antennas are the only brand to incorporate LTE filtering into their full antenna line. Every single antenna is designed to reject LTE signals from US carriers. This is incredibly important because as cell carriers build more towers, there’s an ever-growing chance that your home or office is going to be very near one, and that the LTE signal will be a lot stronger than distant antenna signals. LTE provides wireless internet to cell phones using frequencies that were once used for TV antennas. Even though those frequencies aren’t used anymore, older antennas will still pick them up, and newer antennas can as well depending on their manufacture. LTE signals can even affect channels on “fractional” frequencies — For example LTE transmissions at 792MHz can also affect broadcasts at 396 and 198MHz, which are half and one-quarter of the frequency used by LTE. By blocking LTE transmissions completely you have the best chance of picking up all the channels you want, interference-free. This antenna performed very well in testing compared to other small outdoor antennas, and also compared very favorably to midsize yagi-style antennas. For this test, a 3′ length of bare wire was arranged in a dipole shape and tested for reception. The DiNova Boss was placed in the same position and tested with amplification off and on. In both cases the power supply was in line, proving that the amplifier will perform with or without power. All tests were conducted on the same day with the same weather conditions, at our laboratory approximately 55 miles from broadcast towers. For more information on how to interpret these charts, check out this tutorial or this video. When you look at just the amplifier gain, you really see the quality of this product. Unlike other amplifiers, the amount of gain is very consistent from top end to bottom, showing only a slight drop toward the very high end. This indicates the presence of a slope compensator, which adds more power to the high end to make up for the relatively harder job of amplifying higher frequency signals. While there is a drop in gain around 600MHz, this should be less of a problem in the future as that frequency has been allocated to new cell signals and TV stations will be vacating it. Signal-to-noise ratio is the most important measurement for antenna signals. This chart shows the DiNova’s performance. The yellow zone means a channel will probably come in reliably. You may lose reception in bad weather. Connecting the antenna to more than one TV may mean losing some stations in the yellow zone. You can see that the amplifier is nice and clean because the amplified SNR is always higher than the unamplified SNR. Noisy amps actually lower SNR. A noisy amp could actually perform worse than an unamplified one. That’s not the case here. Here you can see more stations in the yellow and green ranges, meaning you’ll actually get those channels. This chart doesn’t show anything in the VHF-Low range. This antenna will definitely pick up VHF-Low stations. There simply aren’t any in our testing area. This antenna performs incredibly well compared to last year’s DigiNova. That is a big surprise. The DigiNova I tested isn’t new, but it should perform like a new one. There’s a significant bump in the VHF range, probably due to the dipoles. However, performance is still about 10dB higher throughout. This is due to cleaner electronics and a revamped amplifier. More signal strength means this antenna should work better in a multiple-TV environment. Should you buy this antenna? In tests, the DiNova Boss Mix performed better than higher-priced antennas. Build quality is much better than lower-priced options. It’s a good choice for someone who is looking for good performance from a compact antenna and it meets with OTARD rules so it can be mounted in any private space regardless of HOA restrictions. The DiNova Boss Mix the most flexible antenna in its class because of its passive amplification and LTE filtering. It’s durable, strong, and smart. 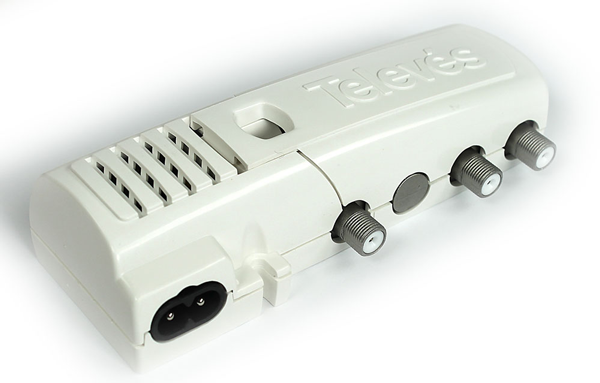 Try the DiNova Boss from Televes, available now at Solid Signal! Can you add satellite TV to old fitness equipment?